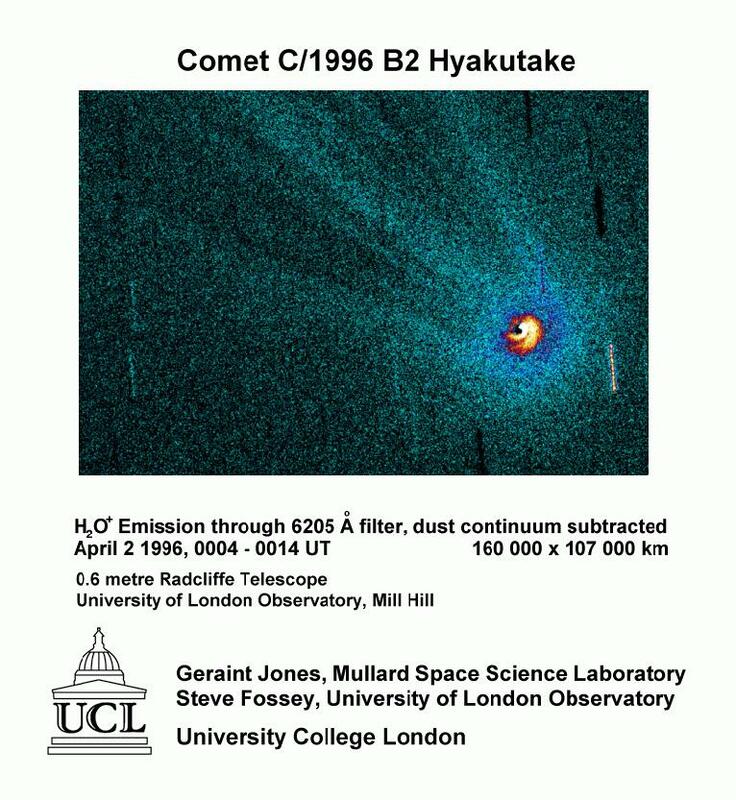 This image of the inner regions of Comet 1996 B2 (Hyakutake) was taken just after midnight UT on the night of April 1st/2nd 1996 using the 0.6 metre Radcliffe refractor at the University of London Observatory, Mill Hill. The observations were carried out by astronomers from University College London - Geraint Jones of the Mullard Space Science Laboratory, Department of Space and Climate Physics, and Dr Steve Fossey of the University of London Observatory, Department of Physics and Astronomy. A 10-minute CCD image was obtained through a narrow-band filter centered at 6205 Angstroms, which included emission from H2O+ ions, while another was obtained through a second narrow-band filter centered at 6250 Angstroms, which let through dust-scattered sunlight alone. By subtracting the dust image from the dust and ions image, the tail rays were revealed. The image measures approximately 160 000 by 107 000 km at the comet. At the time, the comet was 40.9 million km from the Earth, and 0.88 AU from the Sun.